Cooking with truffle oil feels like cheating. So if you want to argue that this recipe doesn’t really “count” because it uses truffle oil, I won’t disagree. I will, however, keep on making it. And I bet you will, too. My big problem with salad is the temperature: I like my main dish to be at least warm, if not hot; a cold salad always feels like a side dish to me. Mixing some warm grains in with your fresh greens solves the problem. 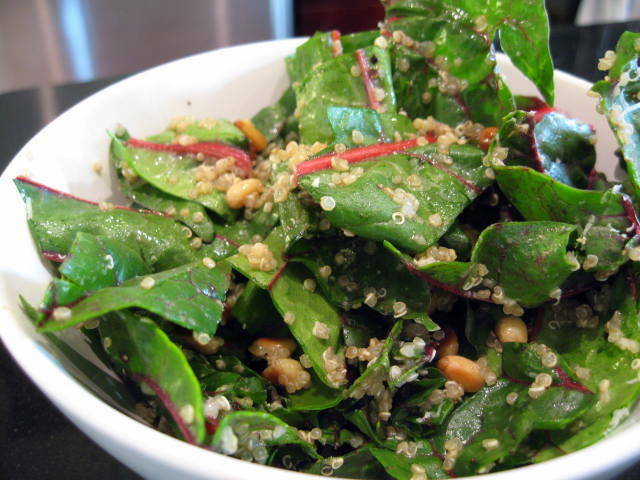 Quinoa and chard alone are good, but add pine nuts, Parmesan, and truffle oil and there won’t be a single leaf left over. Add quinoa to small stockpot and add 2x water. Turn to high heat, bring to boil, then reduce heat to medium. Cook until water has been absorbed and quinoa is soft when you bite it. Drain quinoa and put into a large bowl. Wash and stem the chard, reserving stems for later use. Cut chard into bite-size pieces. Toast pine nuts in a dry pan over medium heat. 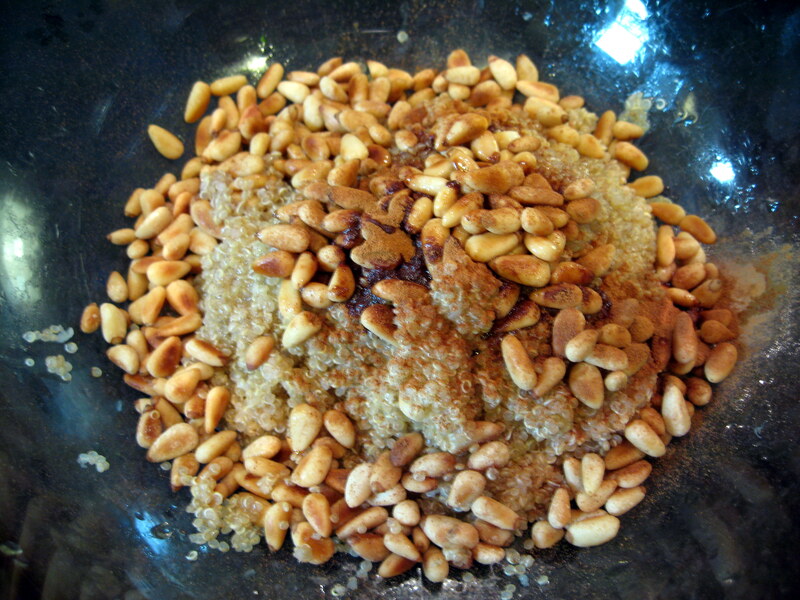 Put pine nuts into the same large bowl as the quinoa. Toss with chard. Drizzle with truffle oil and toss to mix. Add Parmesan and salt and pepper. Toss some more and adjust seasonings as necessary.